Rosh Hashanah is the Jewish New Year festival and commemorates the creation of the world. Rosh Hashanah is also a judgement day, when Jews believe that God balances a person's good deeds over the last year against their bad deeds, and decides what the next year will be like for them. God records the judgement in the Book of Life, where he sets out who is going to live, who is going to die, who will have a good time and who will have a bad time during the next year. The book and the judgement are finally sealed on Yom Kippur. ​The Rosh Hashanah song for the Jewish New Year. Time is spent in the synagogue on Rosh Hashanah, when there are special services that emphasise God's kingship. 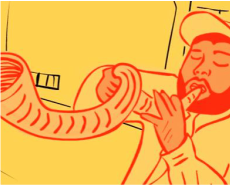 One of the synagogue rituals for Rosh Hashanah is the blowing of the Shofar, a ram's horn trumpet. In Jewish homes a special meal is served, with the emphasis on sweetness. Apples are dipped in honey, as a symbol of the sweet New Year that each Jew hopes lies ahead. A sweet carrot stew called a tzimmes is often served. Hallah (or Challah) bread is served and it comes as a round loaf, rather than the plaited loaf served on the Sabbath, to symbolise a circle of life and of the year. There is often a pomegranate on the table because of a tradition that pomegranates have 613 seeds, one for each of the commandments, or mitzvot, that an observant Jew is obliged to keep.